This week’s issue of Superior Spider-Man is — wait, hold up. Didn’t that series end, you ask incredulously, losing faith in me with every word? You are right, astute reader, but read on! The master web-spinner Dan Slott has had this all planned out from the beginning, you see, and it will all make sense as soon as we get through this together. Christos Gage’s script, coupled with the artistic team of Giuseppe Camuncoli, John Dell and Antonio Fabela, bring this interesting addendum story to life in a way readers have come to expect and cherish from a Spider-Man title. Maybe a bowl of calamari would have been less subtle? To catch up, way, way back in issue 700 of THE AMAZING SPIDER-MAN, Peter Parker ‘died’, as his consciousness was switched with an ailing Doctor Octopus. Thus SUPERIOR SPIDER-MAN was born, and Dan Slott started receiving all sorts of hate mail, and a few death threats. But, he showed the true believers that he had an ace up his sleeve, and through a great bit of storytelling, brought Peter back and (seemingly) vanquished Doc Ock forever. 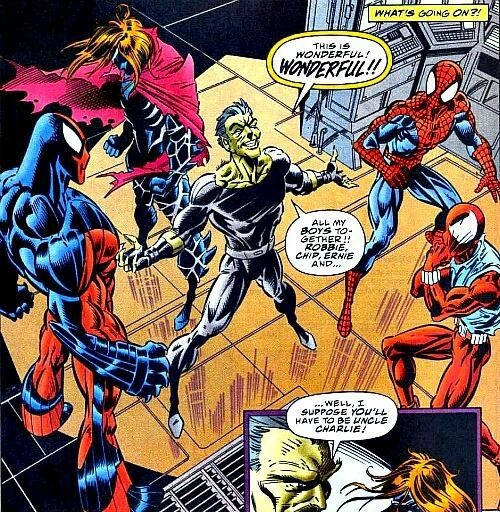 During the time that Otto was masquerading as Peter, he had a run in with the Spider-Man of 2099, as superheroes sometimes do. There was a fight, a lot of confusion, and Horizon Labs, where Peter/Otto was working, was pulled into a temporal implosion. Superior Spidey was missing for a whole 24 hours, and then returned, a little time worn and weary, but otherwise in one piece. That was in issue #19, and that was the only mention of it since. Until now. 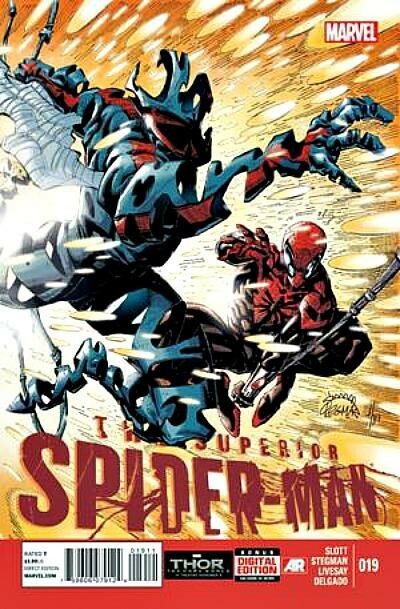 The plot of this issue takes us through what happened to Superior Spider-Man during those 24 hours he was missing in the time stream. This is also the tip of the spider iceberg (spideyberg?) that will be the new Spider-Verse event. Little has been revealed before this point as to what the event might entail, other than the fact that it will affect a lot of different spider themed people. Boy is that ever the case. 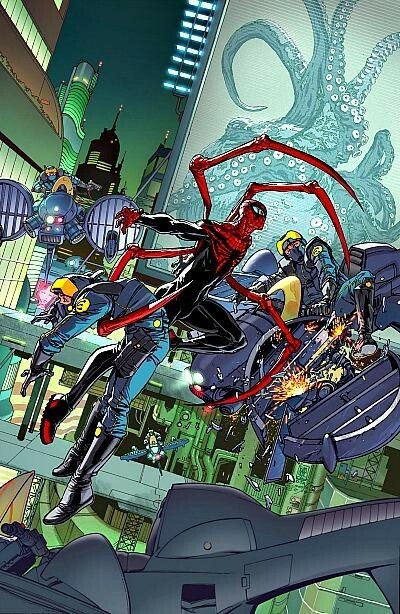 Superior Spider-Man finds himself in 2099, and immediately sets out to acquire the tech to get him back to present day. But things get sticky, and he finds himself jumping through many different parallel timelines, and finding that many of the spider-men in those lines are being murdered. By what appears to be the same weapon. The mystery is afoot, and what Peter/Doc Ock resolve to do is both interesting and a great last panel reveal that I won’t spoil here. The fact that Dan Slott continues to impress throughout the last several years on Spider-Man is a testament to how cool this story is. The mystery of where spidey went in those 24 hours was hung on, and then forgotten in the pages of Superior because a new adventure took place. But to revisit it in this fashion, and also bring it full circle into the new event, Spider-Verse, it sets the stage for what will most likely be an great read, and a rich story. The opposite can be true in this sense, and only time will tell. As a reader of Spider-Man now throughout all of Dan Slott’s run, I have faith in him as a writer and a storyteller of all things Spidey related. But, I will only say this with the hope I am wrong, there are two words that plague the Spider-Man history as a dark spot in his past, and I would hate for this story to de-evolve into something as poorly orchestrated as that. Clone. Saga. For the love of Uncle Ben, and all our sakes, let’s hope that isn’t the case. CBH Score: 4 out of 5. Cool way to bring the character back, and the reveal at the end is very interesting, but we will have to see how Spider-Verse pans out to truly love or hate this issue. I gotta say, I’m amazed that they didn’t make this another #1. That is pretty surprising actually. Although the surprise issue #32 caught my attention pretty well, thinking Superior was donezo. I was surprised how much I enjoyed Amazing Spidey #4 which lays some of the groundwork for the Spider-Verse event as well. I really enjoyed the JMS Romita JR run, so I’m glad to see Slott mining that for new stories. Now I just need to set aside a decade of my life to read the Clone Saga and I’ll be totally ready for this!